If anyone depends on you for financial support, then getting a life insurance policy is not a question of whether you should, but how much you should get. While there are several factors to consider, including your age and health, income, family and dependents, and business circumstances, determining how much life insurance to get doesn’t have to be overwhelming or complicated, especially with the steps we’ve outlined for you below. 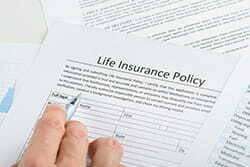 There are two main types of life insurance: Temporary (term) life insurance and permanent (whole) life insurance. Term life insurance is for a set number of years, has low premiums, and does not earn a cash value—when the term ends, the value of the policy is gone. Whole life insurance lasts for the lifetime of the policy owner, has high premiums, and gains some cash value over time which can be used and invested in a variety of ways. Term life insurance is a better option for young families, especially if you know that your situation (employment, family size, assets, etc.) will change over time and you will need to reassess insurance needs. Whole life insurance and all of its variations are better suited to families and individuals who are fairly well settled in life and are looking perhaps to cover long-term debts (such as a mortgage), make sure funeral expenses are paid for, or leave an inheritance for their descendents. Please note that while all of the steps we’ve outlined below are useful for both types of life insurance, some of the details will be more applicable to a term life insurance policy. Deciding how much life insurance to get revolves around two main questions: First, how much money would your family need to meet all immediate financial obligations? Second, how much money would your family need to replace your income and and meet any future financial needs? Let’s break it down into a step-by-step guide for initial calculations. Even if you plan to pay off some of that debt (such as a low balance on a credit card) quickly, include it to make sure it doesn’t become an unexpected burden on your family. 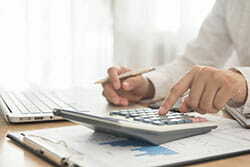 Next, estimate how much your family would need to cover the final expenses associated with the passing of a loved one. These expenses include funeral and burial costs, which are typically estimated around $10,000, plus any medical bills or estate settlement expenses. Once you’ve calculated immediate financial needs, the next step is to determine the amount needed to replace your income. There are a few factors to consider here. First, determine the money needed to replace your income for a year. If you are the sole provider in your family, this number could be quite large. Second, multiply that annual amount by the number of years you intend for the money to support your spouse or children. Consider first, how long you’ll have children living at home, and second, if you want the life insurance money to support your spouse (and for how long) after all the children have become self-sufficient. Take into account the length of time until your spouse retires or qualifies for Social Security benefits. Third, don’t forget to add a little more for inflation—anywhere from 1% to 10%, though many online insurance calculators set it at 3%. 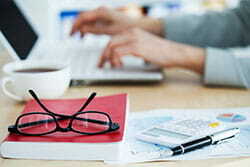 Last, calculate any long-term financial obligations you anticipate. Do you intend to pay for some or all of your kids’ college expenses? What about cars for your children or spouse? Factor any of that into your total costs. This is certainly optional and depends on your family situation—for example, if your children are already grown, you don’t need to worry about providing for their college tuition. If you are self-employed or own your own business, your annual income might be harder to calculate. You’ll want to consider what you expect the future of your business to look like. The general rule is to provide your spouse, family, or business partner with enough funding to keep the business going without you, or to provide the beneficiary with the funding to buy your shares in the company. The exact calculations will vary based on your unique situation. Also, please note that stay-at-home spouses need coverage, too. Even if they aren’t bringing in an actual paycheck, the cost to replace them in terms of childcare and housekeeping would be significant. In that scenario, calculate the costs that would be added to the family’s monthly expenses and use that as the base income amount. Keep in mind that it’s always better to round up in your estimations rather than round down. Each of these sources reduces your total insurance needs. For example, if you have college funds already set up for your kids, you won’t need as much life insurance to cover those costs. Perhaps you have enough in savings to provide your spouse with a few years of support, or your retirement fund will be sufficient past a certain point. Also keep in mind that ideally, while you are paying the monthly premiums for your insurance policy, you will also build your assets by adding to your savings accounts, retirement funds, and other investments. Even if your current resources wouldn’t last very long, they will continue to grow. 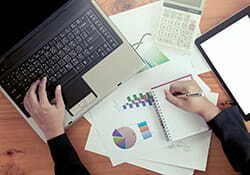 With the total amount of your assets in hand, subtract it from the total insurance need to calculate your final number. That’s how much life insurance you should get, and you can begin shopping around for a policy that works for you. Let’s use a hypothetical family as an example: Paul and Rebekah have two kids (ages 8 and 5) and want to get a 15-year term life insurance policy for Paul. Step 1: Add up current debts. Paul has $130,000 left on his mortgage plus $10,000 left on a car loan for a total of $140,000 in debts. Step 2: Account for funeral expenses. Paul plans to be buried traditionally so he adds $10,000 to his expenses calculation for a total of $150,000. Step 3: Replace annual income. Paul currently earns $50,000 per year, so for 15 years the total amount to replace his salary would be $750,000, for a total of $900,000. Step 4: Consider future expenses. Paul would like to help pay for his children’s college expenses, so he adds $50,000 per child to his calculations ($100,000 together) for a grand total of $1 million in life insurance needs. Step 5: Subtract current assets. Paul has $35,000 in a savings account currently, as well as $15,000 in a college fund. He also carries a $100,000 group life insurance policy through work. This adds up to $150,000 in assets, which brings his life insurance needs down to $750,000. No matter what your financial situation is, if you provide someone with monetary support and security, you need to have a good life insurance policy in place. Whether you have a young family that relies on you or you just need coverage for end-of-life costs, life insurance is a way to cover all the financial needs your beneficiaries will face. Instead of basing your life insurance on what sounds like a decent amount or what monthly premiums you can afford, take the time to calculate both the immediate and future needs of your family. That way you can feel secure that they will be taken care of, no matter what happens.